As an eCommerce shop owner you live and die by things like your total revenue and your average order value. We understand the need to spend so much time looking at the numbers–we do it too. 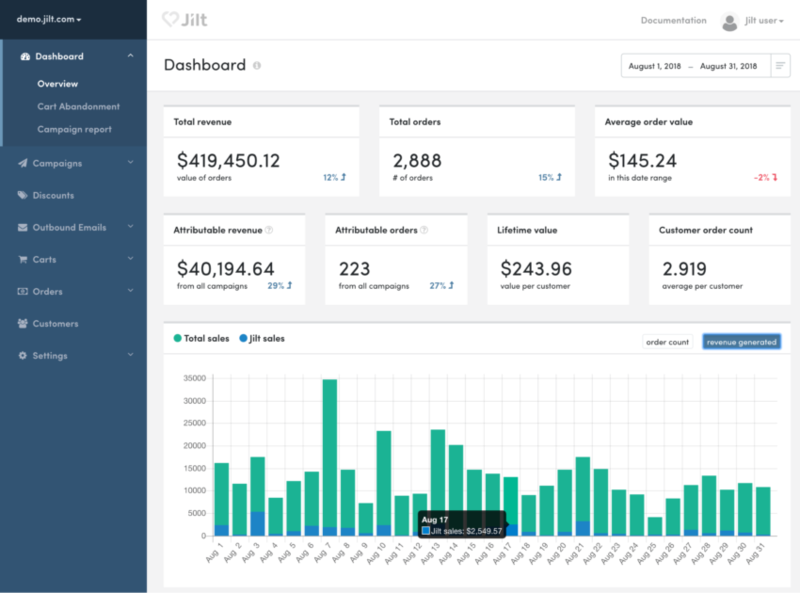 At Jilt we track all sorts of metrics about app usage, recurring revenue, and traffic. Just like you, we use this data to get an overview of the health of our business and where we can improve. We know how exciting it is to launch a new product or campaign and then watch as the numbers tick up and the revenue starts rolling in. We wanted to make it easier for you to get those important numbers about your the performance of your shop and how lifecycle email marketing campaigns contribute to the your success. That’s why we’ve overhauled our dashboard and revenue reporting features. Read on to find out how. We’ve rapidly expanded Jilt over the past couple of months to support new types of lifecycle emails. In additional to abandoned cart recovery campaigns, you can now send welcome emails, post-purchase emails, win-back campaigns, thank you emails, feedback or review requests, and replenishment reminders. Jilt also now supports sending lifecycle emails for users of WooCommerce Memberships and WooCommerce Subscriptions. With all these new types of emails, we built a new and improved dashboard that provides combined stats about all your campaigns, as well as an overview of important store metrics, like total orders, average order value, and customer lifetime value. We moved the information from the previous dashboard (which was focused on cart abandonment campaigns) to a new cart abandonment-specific dashboard, accessible from the side navigation panel. 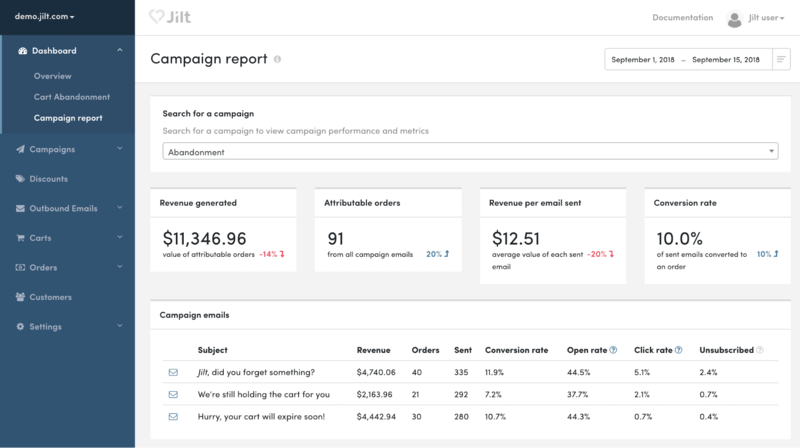 Each individual campaign now also includes a detailed report, so you can track things like open rate, click rate, conversion rate, and generated revenue on a per email and per campaign basis. We’ve also improved the way we’re calculating how revenue is attributed to Jilt emails to better account for all the new types of lifecycle emails you can send with Jilt. The main dashboard (above) shows important, top line metrics every eCommerce shop owner should track. You get a quick, at-a-glance overview of vital metrics like your total revenue, total orders, average order value, and customer lifetime value and order count. This report also shows how much money you’re making from your Jilt email marketing campaigns (attributable revenue). 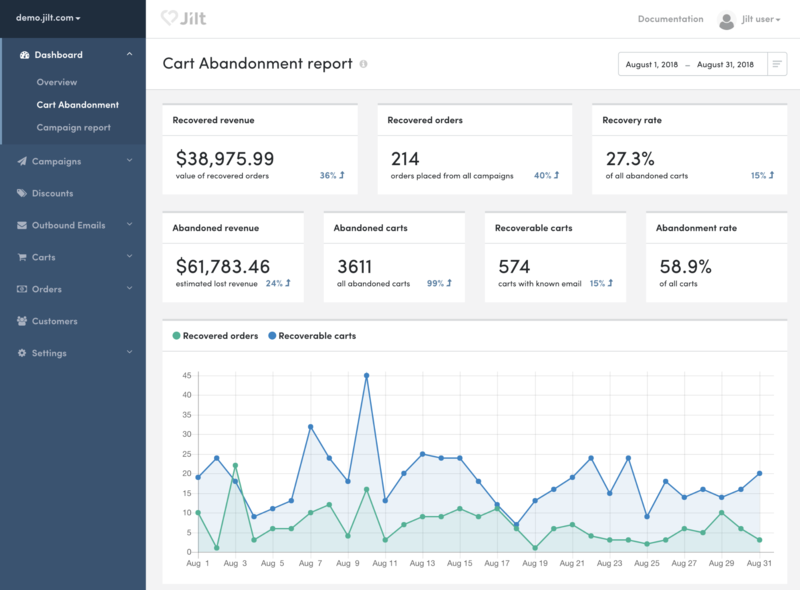 The new cart abandonment report is where you’ll find some of the metrics that were previously on the main dashboard, like your abandonment rate, recovery rate, and recovered revenue. We made a small change here to split “abandoned carts” into two new metrics: total abandoned carts and recoverable carts, which are abandoned carts with a valid email. Each campaign also has its own metrics report. These reports help you easily monitor the success of your campaigns and individual emails within campaigns. We measure open and click rate based on people who open emails, rather than using total opens divided by click count. This way, each person is only counted once. These dashboard improvements are designed to show you revenue generated by all emails you send with Jilt and ensure that the most important stats for your store are always close at hand. In Shopify, a cart is considered abandoned only after the customer begins filling out the first page of the checkout process. But what if your customer doesn’t click through to the checkout? Even if Jilt captured their email address, there was no way to recreate the cart. This is a problem even for the built-in cart recovery feature within Shopify and nearly all other platforms need the customer to click through to the checkout in order to recover an abandoned cart. We’ve fixed that by tracking abandoned carts immediately after a visitor adds an item to their cart (along with their email address, if you’re using our add to cart early email capture popover feature). Jilt can now recover carts even if customers don’t reach the checkout page. When Jilt sends a recovery email, we’ll automatically re-create their cart when they click the recovery link and redirect the customer to the checkout page. 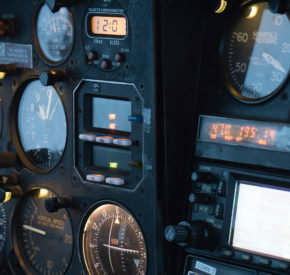 In August, we announced we were building a Zapier integration, which connects Jilt to over 1,000 other apps. We’ve been excited to see all the ways you’ve been taking advantage of the first version of the integration, and now we’re making it even better. The initial version of our Zapier integration used Zapier’s built-in webhooks tool to connect Jilt with other supported apps. Now we’re building a full Zapier integration, with pre-defined triggers for when new customers are added to your store and for when someone unsubscribes from your emails. We’ll continue to add additional triggers to this new Zapier integration so you can create helpful workflows that connect Jilt to other apps you use. Are you interested in helping us test out the new Zapier integration? Let us know! Please, please, please add more triggers. It would be nice if we could create campaigns based on certain opt-ins. Hey Cedric 👋! What opt-ins would you like to see triggers on? Happy to chat more about this over, could you get in touch or send an email to help@jilt.com?